The Board of Education has determined a preferred option for seismically upgrading Victoria High School. 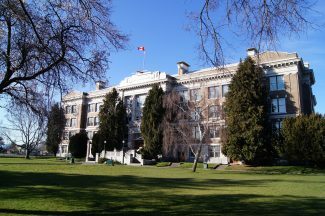 Trustees directed the Superintendent to submit seismic plans to the Ministry of Education that preserves the building’s heritage, adds capacity for 200 students, and includes a Neighbourhood Learning Centre (NLC). The ‘Seismic Plus Enhancements (1000) Plus NLC’ Option includes upgrading the 1914 building to meet current seismic safety standards. The option will retain the exterior of the current building while enhancing the interior. The biggest change will be the modernization of learning spaces for staff and students. Other upgrades will include new concrete stairwells, upgrades to the mechanical systems, and the installation of a new fire sprinkler system. The option also involves building a two-storey addition on the east side of the school that will accommodate 200 more seats, increasing the school’s capacity to 1,000 students. The District will also apply for funding to include a Neighbourhood Learning Centre; Neighbourhood Learning Centres provide space for community-based programs and services and are funded from a different Ministry of Education program than seismic upgrading. Community input was sought to help inform the decision-making by the Board of Education. During April, an extensive public consultation process was undertaken that included open houses, staff and student sessions, and an online survey. There were a number of considerations when planning for upgrades to the high school including educational needs, capacity, and student enrolment projections. Other considerations included operating and capital costs, heritage, environment, community values, and community amenities. There was a range of options presented to the public, including a full seismic upgrade, building a new high school, or retaining the exterior facade and rebuilding the interior. See Vic High Backgrounder for option details. In April 2018, an extensive public consultation process was launched to provide an opportunity for the community to learn more about the options and provide input about what’s important to them when planning for the future. More than 1,700 people participated in the open houses, staff and student events and an online survey. The Board of Education was provided with an Engagement Summary Report that compiled all of the information collected. After considering the input from the public and stakeholders, the Board of Education directed the Superintendent to further explore the costing of specific options. These options included Seismic with Enhancements, Seismic Plus with Enhancements and additional capacity, and a new build. At the Board Meeting on June 25, 2018, Trustees voted to submit the ‘Seismic Plus Enhancements (1000) Plus NLC’ Option to the Ministry of Education for approval. The estimated cost of the ‘Seismic Plus Enhancements (1000) Plus NLC’ Option is approximately $73.3 million. This includes the addition of a Neighbourhood Learning Centre, which would cost approximately $6 million. Proceeding with this option will be contingent upon receiving funding from the Ministry of Education. Once a decision is made, planning will take approximately one year and then construction will occur over two school years. Victoria High students will be accommodated at S.J. Willis during construction. For the Long Term Facilities Plan, click here.